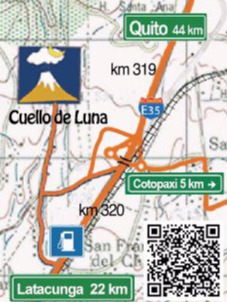 Campground Hotel Cuello de Luna Cotopaxi - open all year - pitches for RVs, motorhomes, caravan, camper and tents, 4 miles from Cotopaxi NP - Cotopaxi National Park Camping - full hookup - dump point - class B campsite. On our awesome campsite, with restroom and hot shower camping cabin, extensive grass-covered level hard standings are available for RV‘s and tents. For RV‘s and camping there is no reservation needed, just come and visit us.... you will have access to hot shower and toilet in the camping cabin, water supply, power supply 110/220V, grey and black water dump, restaurant, BBQ area (firewood at extra cost), laundry service, tourist information in the middle of a wonderful Andean landscape. We provide pick up and drop off service eg. to Quito airport and arrange all kind of tours and excursions. The campsite on our property is safe and supervised. Motorhomes and tents can be left alone for hours, days or even weeks. This gives you the freedom to make excursions in the Cotopaxi area, visit the Galapagos Islands, the Pacific coast, the jungle or even your friends and family back home without worries. Camping, tents price per person USD 5.00 per person Ask for special family and group rates !